1. Each member of the SecurityCouncil shall have one vote.2. 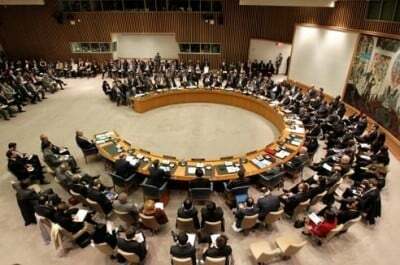 Decisions of the Security Council on procedural matters shall be made by an affirmative vote of nine members. 3. Decisions of the Security Council on all other matters shall be made by an affirmative vote of nine members including the concurring votes of the permanent members; provided that, in decisions under Chapter VI, and under paragraph 3 of Article 52, a party to a dispute shall abstain from voting. Five countries were granted special status: America, Britain, China, France and the former Soviet Union – now the Russian Federation. They’re permanent Security Council members with special voting power known as the “right to veto” SC measures. During the post-Soviet era, Washington used its veto power scores of times, Russia only eight “no” votes. Ahead of the UN’s 70th anniversary next month, US-installed Ukrainian fascists want Moscow stripped of its right to dissent during this month’s General Assembly session. It’ll take more than a GA vote to alter the UN Charter. It requires a two-thirds majority of member states – including all P5 countries with veto power. It’s unlikely any will choose to limit their own authority. Washington nonsensically claims Russian vetoes threaten the Security Council’s legitimacy. It challenges its hegemonic agenda, blocking efforts to authorize war on Syria among other important actions. US UN envoy Samantha Power is one of numerous neocons infesting the Obama administration, an advocate of endless wars dressed up as humanitarian intervention. She criticized Russian vetoes, saying they force America to “forum-shop” to further its agenda. “If a particular body reveals itself to be dysfunctional, then people are going to go elsewhere,” she claimed. And if that happened for more than Syria and Ukraine and you started to see across the board paralysis…it would certainly jeopardize the security council’s status and credibility and its function as a go-to international security arbiter. It would definitely jeopardize that over time. Russia’s veto power is an important tool able to prevent Washington from getting legitimacy for its imperial wars. “The Security Council will lose its relevance” without it, Moscow’s UN envoy Vitaly Churkin explained. Putin is expected to meet with Obama when both leaders address the General Assembly later this month. Churkin expects no major breakthroughs. If agreement is reached on anything, it’ll be an achievement, he explained. He dismissed the hype about alleged Russian military buildup in Syria as baseless Western propaganda. Russia fully observes international law. “There’s no secret about” its legitimate activities. Putin’s initiative for world unity to confront Islamic State terrorists is the most effective way to defeat it, Churkin explained – impossible as long as Washington wants war. US administrations under Republicans and Democrats are the greatest threat to world peace. It’ll take more than Security Council actions to reign in their madness.